Stalking and montería. 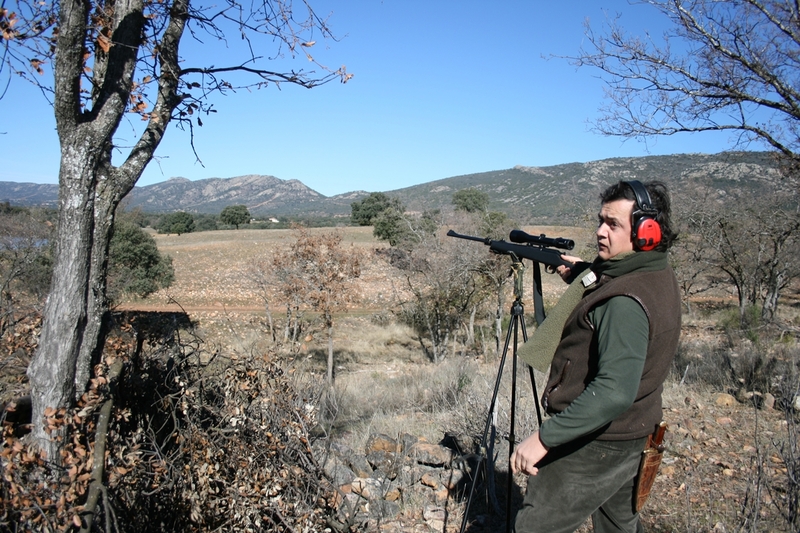 Hunting package - Big Game Hunting in Spain. Stalking and montería. Hunting package: If you are going to come for some monterías, you can also complete your hunting trip with stalking-waiting hunts some days before or after your montería. If your want to hunt different species by stalking-waiting, you can also participate in some monterías by choosing your dates some days before or after the monterías already scheduled. In cooperation with Madrona Landowners United we are proud to offer you monterías in all our hunting grounds. The "Traditional monterías on free range area"
These ones are the cheapest because captures are not warranted. That is, quantity of animals and quality of trophies are low or very low. Nobody can warranty a good result, but these are the most common between local Spanish hunters since they are very cheap (usually < 1.160 USD/ day) and hunters normally do not have limit on captures. Hunting area can be more than 1.500 acres. Dates are set by local hunters one year in advance. General characteristics of the "Traditional monterías on free range areas" (1 montería = 1 day): Quota: 2 stags + all wild boars you can hunt. Number of hunters: 40. Average results of the last years: 30 stags+12 wild boars. Without warranties. "La Cereceda" free range area. "Bohonal Largo" free range area. "Solana de Navalmanzano" free range area. "Solana de Riñoncillos" free range area. "La Aliseda" free range area. "Peña Escrita" free range area. The "Traditional monterías on a fenced hunting estate"
These monterías are the most common for all hunters, Spaniards and foreign hunters. In some cases a certain number of animals can be warranted to be hunted. The prices depend, not only on the quota of animals to hunt per hunter, but also on the quality of trophies and the warranties on captures. Prices from 1.740 USD to more than 6.000 USD/day per hunter. Hunting area usually is 1.200 acres. "Valmayor Estate": > 10.000 acres estate. 3 Weekends available. 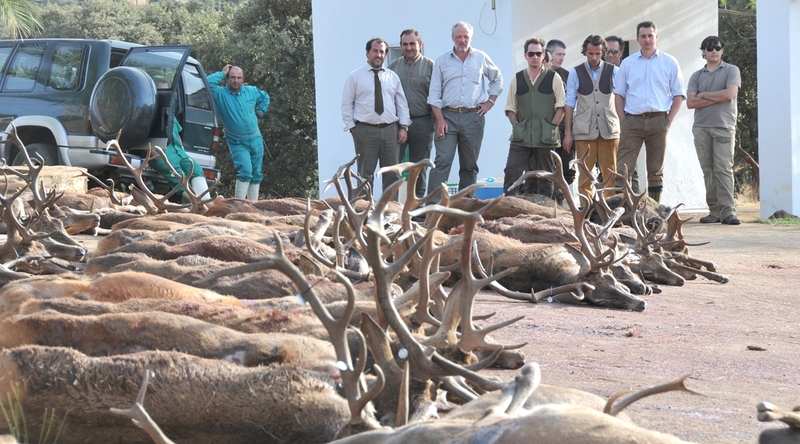 General characteristics of the "Traditional monterías on a fenced hunting estate" each weekend (2 days): Quota: All stags, hinds, wild boars and Iberian mouflons you can hunt. Number of hunters: 42. Expectative: 200 animals. 4 monterías in "Aulagas estate": > 5.000 acres estate. Cuotas and dates can be arranged with you to complete a possible program of 2-3 monterías and other hunting days of stalking and awaiting. "Ganchos (small montería) for few hunters"
Small groups of 7 to 10 hunters. Hunting area normally is 600 acres. The number of beaters and dogs is much fewer than in montería. Number and quality of trophies usually can be warranted in advance by agreement, as well as dates. Ganchos in "Los Claros estate": > 3.800 acres estate. Quota of animals and dates can be arranged with you. You can hire directly 1-2 ganchos or complete a possible program of 2-3 monterías in other estates or other hunting days of stalking and awaiting in "Los Claros" or other estate. With this small driven hunt can be hunted Pure Iberian red deer + Hinds + Iberian mouflon + wild boar. This gancho is only for groups of 5-10 hunters. Ganchos in other estates are available under previous request. This kind of montería is the most special one that you can find in Spain. Only "Valmayor estate" organizes it in the World. It requires more days and much more preparation. Lot of employees are involved as well as horses, dogs, and assistant people for the hunters. That's the reason why "Ancient montería" must be prepare under request. You will live montería as it was celebrated centuries ago, living in austere conditions in the same hunting ground. With uncertain captures, but loaded of unforgettable emotions that only aristocracy enjoyed for centuries. All these exciting experiences have made possible the survival of this ancient tradition to this day. For dates and prices please contact us. Let us know your desires and we will help you to program the best hunting trip.